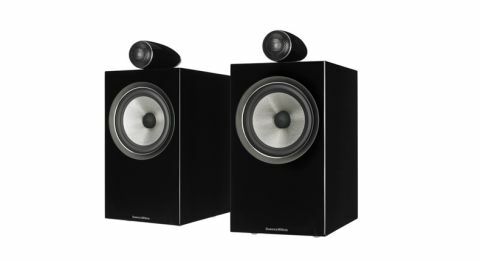 B&W 705 S2 standmount speaker review | What Hi-Fi? Even by Bowers & Wilkins’ high standards, the 705 S2s are a supremely elegant pair of speakers. The premium standmounter in the relatively new 700 Series, it’s the model that benefits most from the trickle-down of 800 Series Diamond technology - most strikingly in the decoupled, solid-body tweeter sitting on top of the main enclosure and giveing the speakers their distinctive appearance. Naturally, B&W makes great claims for the tweeter design beyond mere aesthetics. The tweeter housing’s positioning reduces treble diffraction and allows for higher placement of the speaker’s main driver, which can generate more energy as a result. The housing, which is stiffer than on the 800 and CM Series models, is a low-resonance structure and is decoupled from the vibrations generated by the main cabinet. Moving it a little further forward (the tweeter slightly overhangs the main cabinet) allows for better time alignment between treble and the rest of the frequency range. At least, that’s Bowers & Wilkins’ take on it. The decoupled tweeter isn’t the only bit of advanced engineering that’s gone into these speakers. Like siblings in the 700 Series, the 705 S2 features a new, carbon-reinforced aluminium tweeter dome that’s more rigid than in previous generations. It also reaches further, with the first break-up mode now at 47kHz rather than the 38kHz of before. The 13cm mid/bass driver is in on the upgrade action too, thanks to a switch from Kevlar to Continuum. Designed to continue the good work done by Kevlar in terms of rigidity and controlled break-up, Continuum is the same general approach - but better. Around the back, you’ll find one of B&W’s characteristically dimpled reflex ports, designed to reduce noise and distortion at higher volumes. Below that, there are two pairs of binding posts – we’d recommend bi-wiring the 705 S2s for the cleanest, clearest sound. Despite being relatively unfussy about positioning, the 705 S2s do benefit from standing at least a metre forward of the wall behind them. Even if that isn’t possible, though, we’d advise against using the supplied bungs to attempt to control the bass – a little boom from the back wall is preferable to the muffled toothlessness introduced by stuffing foam into the reflex port. As the B&W 705 S2s are standmounters, B&W hopes many will be drawn to the bespoke FS-700 stands. Not only do they complement the look of the speakers, they also perform as well as any other stand available for the money (£399 or theareabouts). The 705 S2 speakers can even be bolted to the FS-700 stands, but we prefer the bass performance with the components decoupled using the supplied silicone feet (or even Blu Tack). The 705 S2s are instantly impressive. This is a weighty, solid delivery with a quantity and depth of bass that's both disarming and impressive given the size of the cabinet. But this bass, while attractive to the ear and arguably the first thing you notice, doesn't dominate the performance. In fact, it helps imbue the solid mid-range with a richness that makes vocals and acoustic guitars an aural pleasure. Singer-songwriters, such as Norah Jones or Rag 'n' Bone Man, come across particularly well, with a combination of focus, warmth and detail. Add treble that's crisp and clear without ever veering into hardness or harshness, and you've got the complete tonal package. Such is the integration through the frequency range, the sound flows seamlessly from top to bottom. Switch from stripped-back vocal performances to something more energetic, and the 705 S2's reveal a more upfront character than one might expect. Major Lazer's Pon De Floor is chaotic and crazed but the speakers excitedly play along, doing a good job of orchestrating proceedings while getting right up in your face - just as the track demands. Change tack to something else and these B&Ws remain there, right up in your face. The upfront approach that initially excites and engages becomes a little tiresome over time. The sound never quite reaches outright aggression - there's too much tonal refinement for that - but the constant over-enthusiasm can be wearing. Engagement and excitement are two of things we look for in audio equipment, but the 705 S2s appear to have been over-tuned in that direction. The result is a relentlessness that makes every listen an adventure, even when you really want relaxation. These are big, bold and beautiful standmounters that aim to thrill on every listen, but there are rivals around that combine similar excitement levels with greater subtlety and flexibility of reproduction. Owning a pair of B&W 705 S2s is like having a sports car on your drive: peerless in the right circumstances, but a bit too highly strung for the daily commute.